Early Spiderman with "removable" eyes. Early Light Green Hulk with separate hair piece. Vintage Wonder Woman with "raised" star. Vintage Captain America w/ blue mask. Looking for black. 1990s Wolverine with black stem. Thin-foot Wonder Woman with raised star. Late 1990s Batman Variation w/ "rounded" ears. Late 1990s Batman variation w/ "pointed" ears. Note how Spiderman's head gets bigger over time! Batman Movie Variation with special decal. Joker Movie Variation, originally in boxed set. Scarface Movie Variation, originally in boxed set. Riddler Variation, originally in boxed set. Later Wolverine from theatrical release. Later Hulk variation from theatrical release. Later Thor variation from theatrical release. Later Captain America from theatrical release. Iron Man from theatrical release. Spiderman with yet an even bigger head. Most recent Batman "bust" style. Green Lantern, "bust" style release. Superman "bust" style. First ever Superman PEZ! Posted are a number of Superheroes from my collection, many of which show the evolutions of character style and design through the years. Note, for example, how Batman has progressed to reflect the animated and theatrical releases from the 1960s to the present. See if you can identify these eras! Not (yet) pictured are the recent Spider man (Euro and U.S.), Lizard Man, Cat Woman, and an Iron Man variation. Photos coming soon. My "wish list" includes an original vintage Thor and a set of rare "soft head" superheroes. 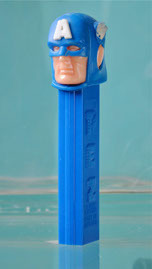 Did you know, that the first Superman PEZ dispenser was not released until 2012? Though each of these characters exists in animated form, they all started out as comic strips in the U.S. and in Europe. Several of the first-series sets shown have “thin” feet, which is a kind of transitional dispenser right after feet were added in 1987. Of particular note is my trio of Charlie Brown dispensers (above) from the early 1990s. The frowning and “tongue” Charlie Brown are very hard to find. The second series Peanuts are those with the larger heads and brighter colors. Garfield and friends is from two different releases: Early 1990s, and late 1990s. Smurfs - Pictured are four (thin foot) from late 1980s, followed by four from the second series, late 1990s. Asterix remakes, late 1990s (European). These four Mario Brothers characters were released in Europe in the late 1990s. The Pokemon series was released in 2001, and are increasingly hard to find.